Why is red meat red? Why is packaged beef a different color on the outside than on the inside? Why do steaks that look the same have different names? What are the Best Ways to Cook Beef? Ideas on how to Roast beef? What type of Beef do we offer? What are the Best Ways to Cook Pork? Why do older cookbooks recommend cooking pork to 180°F? When do you add the barbeque sauce to grilled meats? What is the leanest cut of pork? How do I Sauté and Braise? What are tips for Broiling and Grilling? Is it safe to eat pork that is slightly pink in the middle? What type of Pork do we offer? Beef is aged to add characteristic flavor and increased tenderness. In the “dry ageing” process, beef is held at temperatures from 34° F to 38° F for 10 days to 6 weeks. Beef contains high quality protein with all the necessary amino acids to make a complete protein source. Most plant protein sources are missing at least 1 of the essential amino acids. The pigment that makes the meat dark red reacts to the oxygen in the air through the permeable plastic wraps and becomes bright red. The interior stays dark due to lack of oxygen. Preheat the oven for at least 10 minutes. Cook roasts fat side up on the rack in shallow roasting pan. Use an instant-read thermometer. Insert halfway into roast, making sure not to touch bone. Always allow roast to rest 10 to 15 minutes after cooking before slicing. Cover loosely with a tent of aluminum foil. Slowly brown beef on all sides in small amount of oil in heavy pan. Season beef, as desired. Add small amount (1/2 to 2 cups) liquid to pan. Bring to a boil; reduce heat. Cover tightly and simmer gently over low heat on top of the range, or in a preheated 325°F oven, or until beef is fork-tender. Trim excess fat to avoid flare-ups while grilling. To test the temperature of the coals, hold your hand over them (where the meat would be). If the heat is so intense that you must pull away in 3 seconds, the coals are hot. Four seconds indicates medium heat. Using tongs, turn the steaks halfway through the cooking time. Add extra flavor by making a pouch of wood chips in aluminum foil. Pierce the foil (to release the smoke flavor) and place the pouch on top of the coals. For broiling, place steaks 3 inches from broiler. To pan broil beef, heat a heavy cast-iron or non-stick pan over medium heat for 5 minutes before cooking. Do not use any liquid or fat. Season only after meat has been seared. Turn meat when juices appear through the unseared side. If juices accumulate in pan, pour them off. Slowly brown steak on all sides in small amount of oil in heavy pan. Cover tightly and simmer gently over low heat on top of the range, or in a preheated 325°F oven until beef is fork-tender. Here at Wisconsin River Meats we are proud to offer the best in beef, Midwestern grain fed cattle. These cattle are angus cross beef steers which provide excellent marbling and texture along with size. Chops and lean roasts should be taken off the heat at 145°F to 150°F and allowed to rest for 10 minutes. (The temperature rises 5° while resting.) The United States Department of Agriculture recommends a serving temperature of 150°F for ultimate safety. Yes, the bacteria trichina is destroyed at 137°F. Pork cooked to a temperature of 145°F to 150°F will often have a slightly pink middle. Today’s pork is much leaner. Cooking pork to internal temperatures of 170°F to 180°F will result in dry, tough pork. The sugars in barbecue sauce will burn if they are put on the pork at the beginning of grill time. Add the sauce during the last few minutes. The loin is the leanest with only 4.1 grams of fat (and 139 calories) in a 3-ounce serving. To sauté pork, cook in 2 tablespoons of oil over medium-high heat for a short amount of time. Turn when juices are visible on the topside. To braise, brown pork on all sides to seal in juices. Brown desired vegetables. Place pork and vegetables in a heavy, lidded casserole. Add 2 cups of liquid. Cover and cook over slow heat or in a low oven until meat is tender. Use an instant-read thermometer to determine doneness. To test the temperature of the coals, hold your hand over them (where the meat would be). If the heat is so intense you must pull away in 3 seconds, the coals are hot. Four seconds indicates medium heat. The Food and Drug Administration recommends pork should be cooked to 145°F. Allow roasts to rest 10 to 15 minutes before slicing. Cover loosely with a tent made of aluminum foil. The FDA recommends that pork should be cooked to an internal temperature of 145°F. We showcase Juneau County pork. These are choice, 250 pound butcher pigs. The best in barrow pigs available. Wisconsin River Meats guarantees the wholesomeness of its products. 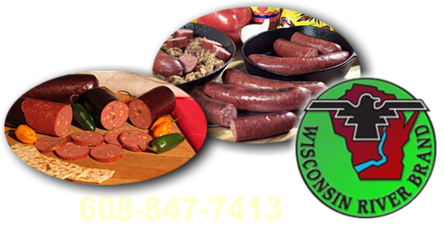 If you are not satisfied that the products are not wholesome and acceptable for consumption, you can contact us at info@wisconsinrivermeats.com and we will arrange to re-ship / replace the product. Service Area: Mauston, Wisconsin Rapids, Baraboo, Sparta, Waunakee, Black River Falls, Richland Center, Nekoosa, Pardeeville, Poynette, Sauk City and surrounding communities.